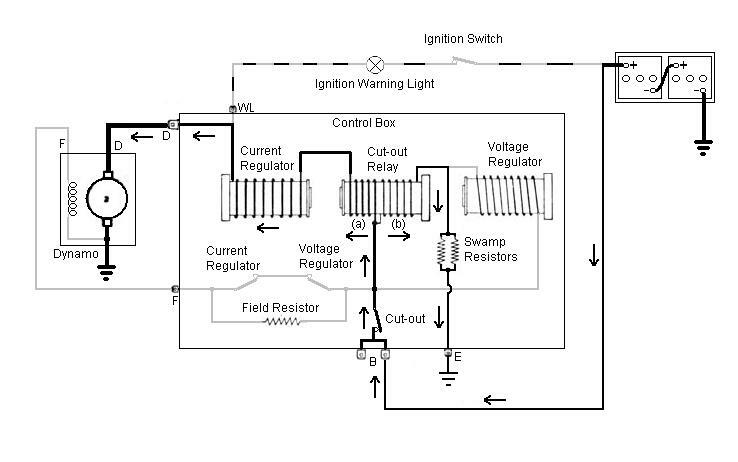 A schematic of the control box and what is connected to it, hopefully a bit clearer than the 'physical' layout in the Workshop Manual. But to simplify things further I've broken it down step-by-step into what happens at each stage of its operation. 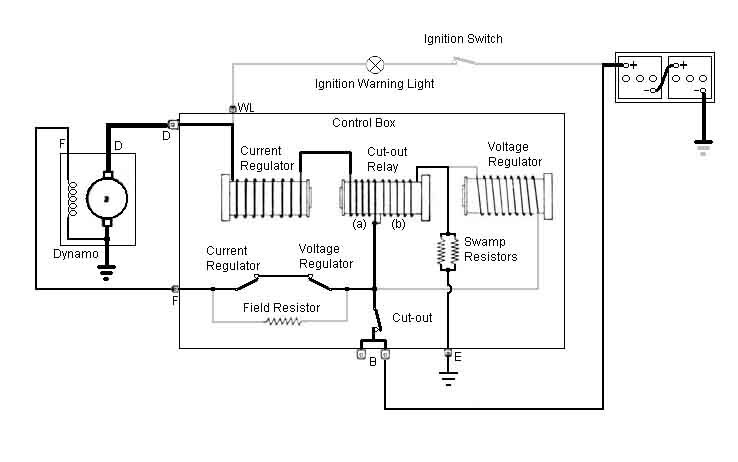 First the ignition is turned on, and current flows from the battery, through the ignition switch, the ignition warning light, a link inside the control-box, and through the low-resistance armature winding of the dynamo so lighting the warning light. Next, the engine is started, the dynamo starts to turn, generating a small voltage from its residual magnetism. This is fed back into the control box, through the low-resistance current regulator and cut-out relay (a) windings, the voltage and current regulator contacts which are both still closed at this stage, and to the dynamo field winding. This boosts the dynamo output and the additive effect causes a rapid rise in dynamo output. Whilst the dynamo voltage is rising towards battery voltage some current still flows through the warning light, but it will be dimming. At the same time dynamo output is passing through the high-resistance (b) winding of the cut-out relay and the swamp-resistors to earth. Eventually (although the engine revs will probably have to increase above the normal idling speed) the voltage rises sufficiently to operate the cut-out relay (12.7 to 13.3v). Its contact closes, and starts to feed dynamo output to the battery and the rest of the cars electrics. 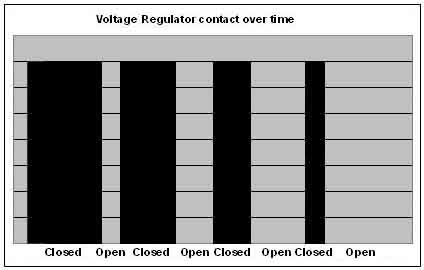 The voltage on the 'D' terminal is now almost the same as the battery voltage, the only difference being the very small voltage dropped across the two low resistance windings of the current regulator and the cut-out relay. As the voltage on the 'WL' terminal is always the same as on the 'D' terminal, the warning light now has virtually the same voltage (i.e. above the 12.7v to 13.3v of the cut-out relay) on both sides, so the light is extinguished. If anything causes the dynamo output voltage to differ (higher or lower) from the battery voltage by more than a few volts, the light will start to glow again - the bigger the voltage difference the brighter the light. The dynamo is now charging the battery, and raising its voltage, and the voltage regulator is sensing that voltage. Eventually the voltage reaches the required level, the voltage regulator relay operates, it's contact opens, which connects a resistance in series with the field winding, which reduces its current, and hence dynamo output. 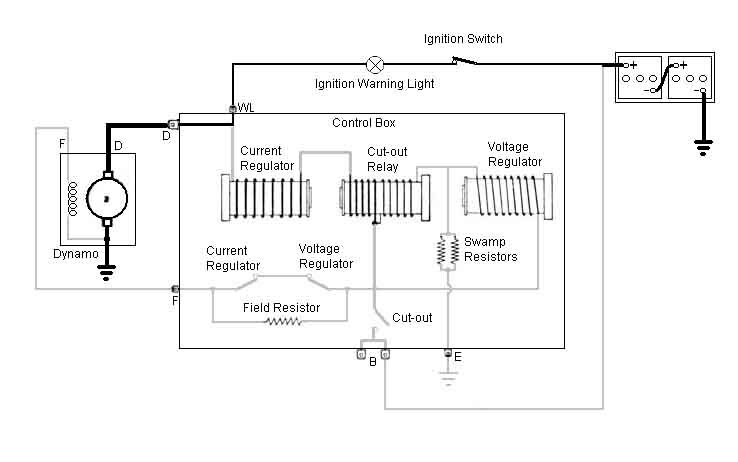 In practice, and under most circumstances, the voltage regulator relay doesn't just operate and remain operated, but is operating and releasing all the time. When the battery needs charging the voltage regulator contacts are closed for a relatively long time and open for a relatively short time, which gives a relatively high average charging current. 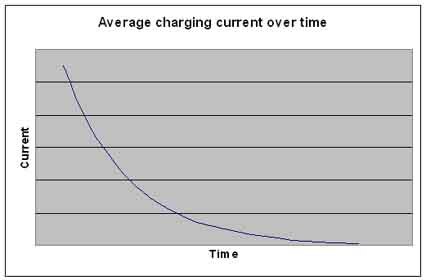 As the battery approaches fully charged the situation gradually reverses to one where the contacts are closed for a relatively short time and open for a relatively long time, giving a relatively lower average charging current. This opening and closing is a very rapid process, and can be felt as a vibration if you lightly touch the voltage regulator armature, and there is a small arcing visible at the contact. 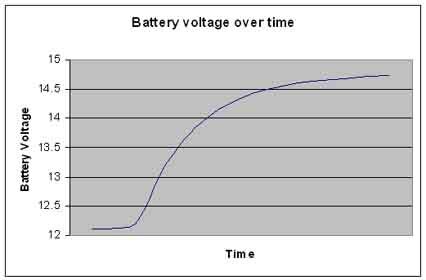 The effect of this is to give a rapid initial rise in battery voltage, tailing off as the battery reaches fully charged (ranging from 14.9 to 15.5v at 10C to 14.3 to 14.9v at 40C). A similar situation occurs with the current regulator. As the current from the dynamo reaches its maximum safe value the current regulator relay operates, its contact opens, which also inserts the field resistor in series with the dynamo field to reduce the output current to a safe value (19 to 22 amps). This also reduces dynamo voltage, and if this drops below battery voltage then the battery will supplying part of the cars electrics, and hence discharging to some extent. Whilst both current and voltage regulator circuits could be operating at the same time it's more likely that the voltage regulator relay will be released until demand on the dynamo reduces and the current regulator relay releases. Now lets consider what happens when the engine slows and reduces dynamo output. Before that happens the dynamo output is flowing through the current regulator windings, and both low-resistance (a) and high-resistance (b) windings of the cut-out relay in the direction indicated, and charging the battery. The two windings of the cut-out relay are such that when current flows through them both in this direction the magnetism to operate the relay is additive. As dynamo output reduces to below battery voltage, current will start to flow the other way through part of the circuit i.e. from the battery, in the reverse direction through the cut-out relay low-resistance (a) winding and the current relay, and through the dynamo trying to 'motor' it i.e. the dynamo will be consuming battery current rather than charging it, and pulling the battery voltage down. Battery current is also flowing through the high-resistance (b) winding of the voltage regulator in the same direction as before, but because the current through the low-resistance (a) winding has reversed the magnetism of these two windings is now in opposition. As the magnetism created by (a) increases it eventually becomes equal and opposite to the magnetism created by (b). When this happens the cut-out relay releases, and disconnects the battery from the dynamo. 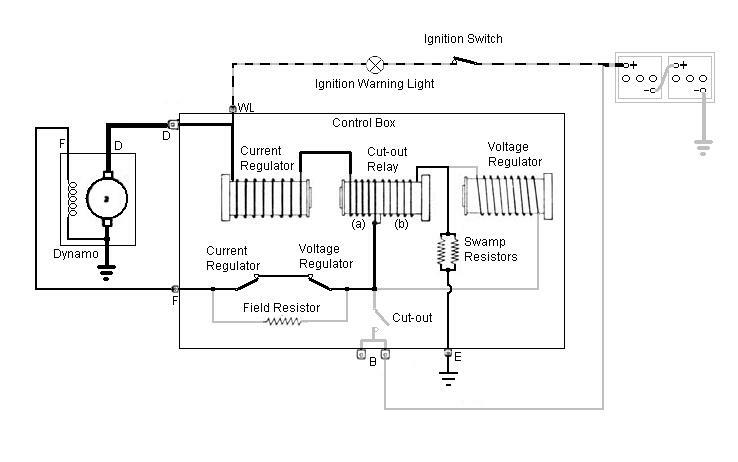 This happens when the reverse current is between 3 and 5 amps and the system voltage has dropped to 9.5 to 11v. Without this current reversal i.e. if the cut-out relay were simply sensing dynamo voltage, it would never release, even when the engine stopped as it is also sensing battery voltage, and the high current from the battery through the control box and the dynamo would destroy them very quickly. This is why you should never manually operate the cut-out relay with a stopped engine, as the relay will 'latch in', and unless you force it to release pretty quickly damage will occur. Finally let's consider what happens when you switch off the ignition of a running engine, say one running fast enough to keep the ignition warning light off. You should notice that immediately you turn off the ignition the warning light comes on fully. But the engine starts to die, and as it does so the warning light flickers and dies with it. When you first turn the ignition off, you have disconnected battery voltage from the switch side of the warning light, but it still has full charging voltage from the dynamo side. However also on the ignition switch side of the warning light are the feeds from the ignition switch to the ignition coil, fuel pump, instruments etc. This allows current to flow from the dynamo, through the warning light and those components to their earths. This current is more than enough to light the bulb, but not enough to keep the ignition system producing sparks, which is why the engine dies. As it does so the dynamo output voltage drops, but initially the light remains bright as current can flow from the battery via the low resistance windings of the relays to the WL terminal. As before the reducing dynamo voltage causes the current through (b) to reverse, and when its magnetism is equal and opposite to that created by (a) the cut-out relay releases. The warning light is now solely dependant on dynamo voltage, and flickers and dims to nothing as that slows to a stop. So, what are 'swamp resistors'? I've not found a totally convincing explanation out if several I have come across. 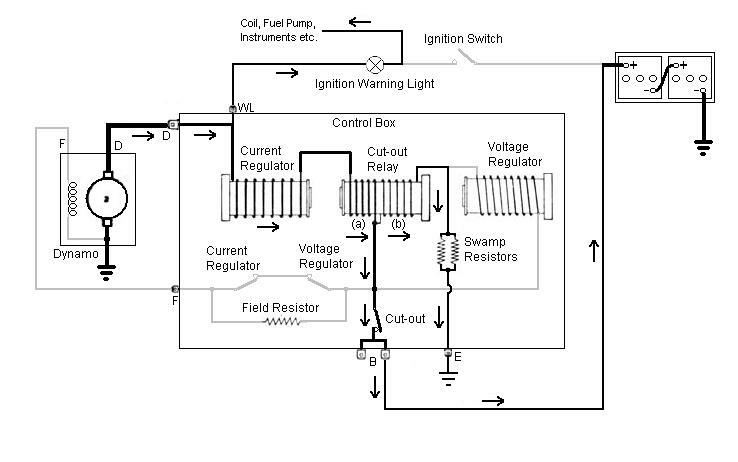 The SU fuel pump is said to have a swamp resistor connected in parallel with the solenoid winding, but this is more to do with an early attempt to limit the arcing and burning of the contacts before capacitor suppression was introduced. There is also a description of a swamp resistor being used in series with transistor emitters to counteract the temperature sensitivity of semiconductors, which have a negative temperature coefficient, whereas wire-wound resistors have a positive temperature coefficient. But in this case both the relays and the resistors are wire-wound i.e. both positive temperature coefficient, and temperature compensation is dealt with in the control-box by using bi-metal strips in the relay return springs. Other usage in series with a circuit seems more about current limiting i.e. more of an 'anti-swamp' resistor. Yet another explanation says it allows the number of turns of wire on the relays to be reduced while keeping the current to a safe value. I can't really see that, thinner wire would reduce the current, and take up less space at the same time. Looking at the circuitry I think there is another reason. 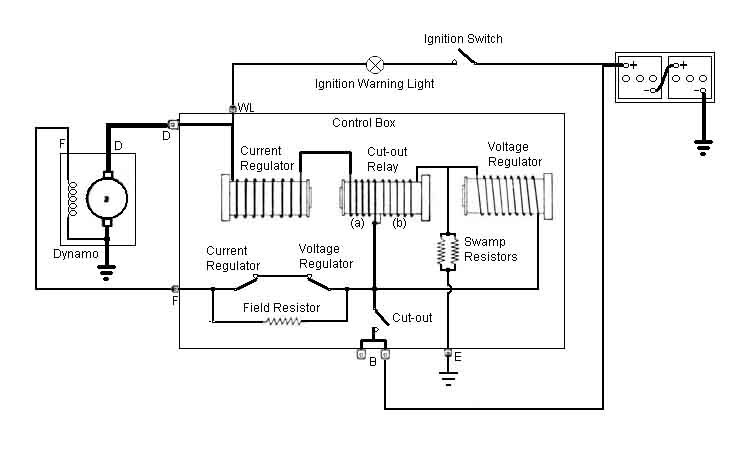 Both the cut-out relay high-resistance winding, and the voltage regulator winding (which is also high-resistance) are connected together before the swamp resistors, so current from both of them passes through the resistors. The effect of this will be to vary the voltage at the three-way junction according to how much current is flowing through each winding, and that varying voltage will affect both relays. The higher the voltage rises at the three-way junction the more voltage there will need to be at the other end of each relay, before that relay will operate. In other words, current through one relay will have an effect on the operating and releasing point of the other relay, i.e. a form of compensation. Under what circumstances that compensation is needed I don't know. There are two resistors in parallel to share the current load, if there were only one it would need to be half the value to maintain the voltage characteristics, would carry twice the current and have twice the heating effect, and so need to be physically bigger or have a heat-sink to dissipate that heat without damage. Having two smaller ones wired in parallel, but physically separate, is an alternative method of dissipating the heat over a larger area.